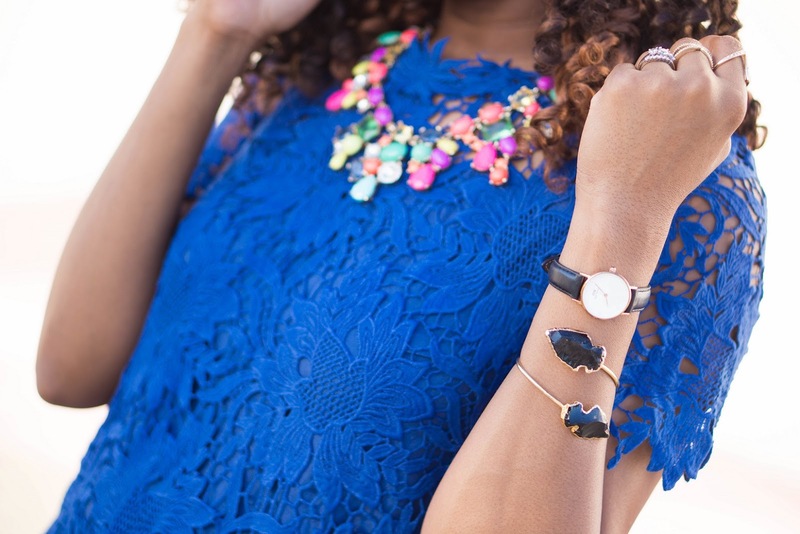 There's something about blue lace and this Lily Wang statement necklace that I just can't deny. I wore a very similar look almost exactly a year ago, and I still can't get enough of mixing delicate lace with edgy accessories. Usually, I would wear heels with a dress, but I really felt like switching it up and wearing sneakers instead. 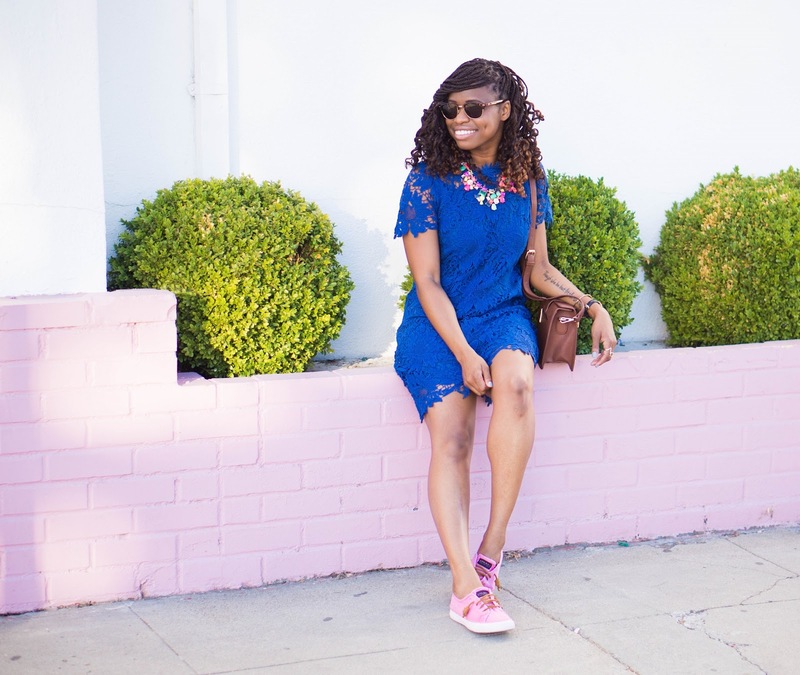 Casual shoes and a dress -- what's not to love! Earlier this month I wore this great music note and bow ensemble from Chicwish, and now I'm showing you this beautiful lace number. I can honestly say that I'm a Chicwish convert. The material is superb and the fit is great. If you haven't shopped Chicwish yet, then you're missing out! So I recommend that you get a move on. The same can be said for Rocksbox if you're a fan of this gorgeous agate spear cuff. Use my code (cherylbff59) to get your first box free! And I'm all about my color combos. You know how much I love black and white, but I'm also a big fan of pink and blue (and red and black, too). What about you? Any favorite color combos? Ooooo...that pink-and-blue combo looks really good, Cheryl! Must try that. And that dress is just pretty awesome. SO cute!! Love the color of the dress. And of course, I LOVE your accessories! Amazing dress! You look fabulous in blue! Love the way the bold colors of the necklace pop against the vibrant blue of your dress! How cute is your dress! I love the cobalt blue lace!! I'm also loving those pink sneakers... I need them in my life! Love the bold blue! What a pretty dress! what a cute combo, I love that dress with those kicks. 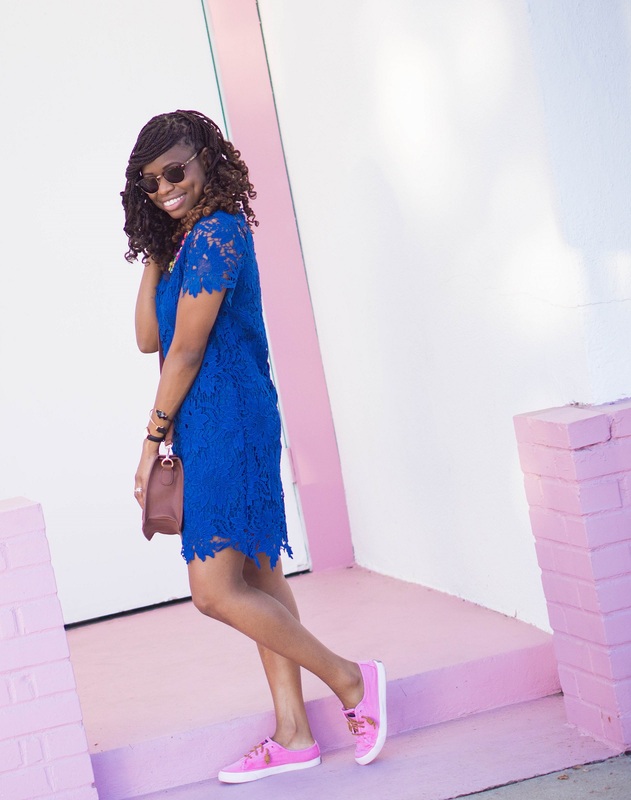 Your blue Enamour Lace crochet shift dress is beautiful!. 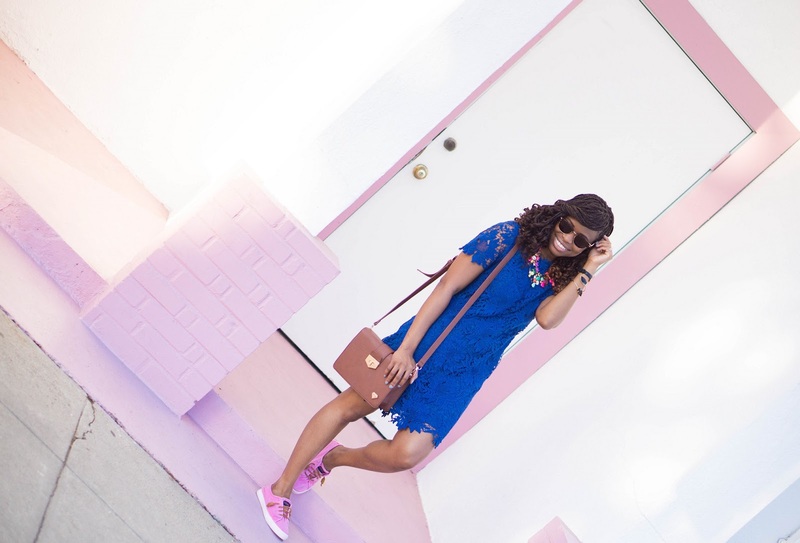 I also love your sunnies, your Shop Lately Lily Wang necklace, and the complementary contrast of your pink Sperry Topsiders Seacoast Sneakers with your dress (I love blue and pink together). 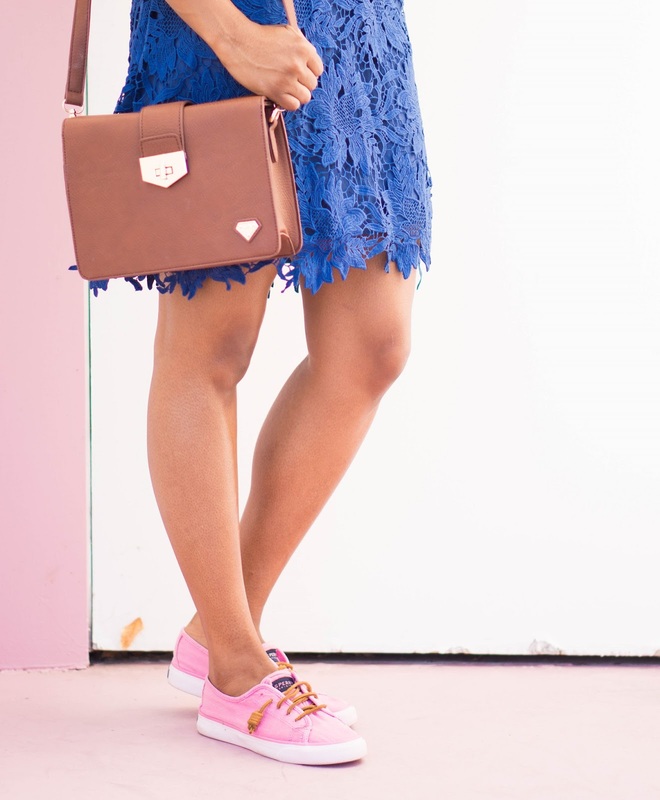 How cute and chic is this outfit on you. . . you wear it all very well my Dear. Ver pretty - I love how unexpectedly your wore it with sneakers. The blue lace dress is beautiful. I like the color combination and the casual styling. The color, the lace, the dress! Slam dunk girl! This shade of blue is everything on you. Slaying! I love blue and pink together. You always look so great in bright and bold colors! Stunning. I love the shape of the dress and it's colour set against the background. Gorgeous! Oooh... I am obsessed with this look! 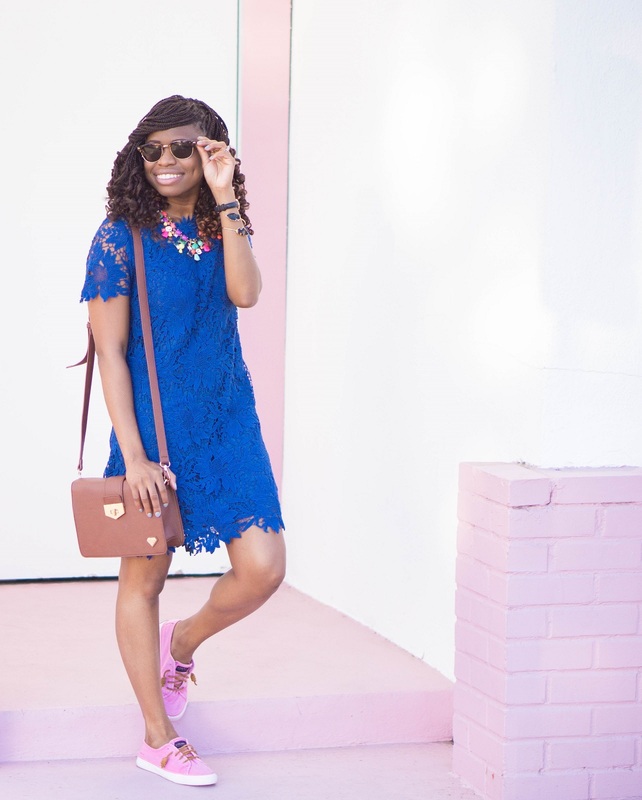 Lace and cobalt are two of my fave things in fashion! Love the dress...you use the most gorgeous color combinations!